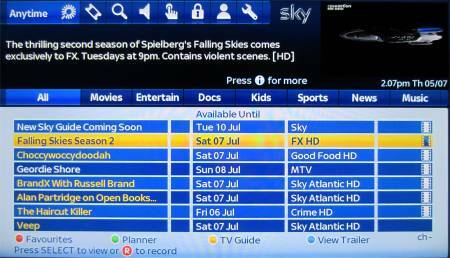 We take a closer look at Sky Digital’s High Definition TV service, and the Sky+HD satellite TV recorder. Sky Digital offers over 50 high definition TV channels – far more than rivals Virgin Media and BT Vision. High Definition TV pictures are lot sharper and clearer than standard TV pictures – with four times more detail than standard TV broadcasts. Sky HD comes with a special Sky satellite receiver, the Sky+HD Box, which is basically the popular Sky+ box with an output for connection to a high definition TV. Pause and rewind live TV. FREE Sky+HD Box – New customers pay no installation fee if ordering Sky+HD online with broadband and phone calls. Note that there’s a Sky+HD subscription charge to get Sky’s HD channels, on top of your existing Sky TV subscription. Marks & Spencer voucher for new customers signing up to Sky online. Virgin Media: Now offering 29 HD channels including BBC, ITV, Channel 4, E4, Sky 1, Sky Sports HD, Film 4 HD and ESPN. Subscription to the HD service is just £5 a month. More: Virgin HD. Subscription-free: BBC One HD, BBC Two HD and ITV 1 HD are available with no subscription with Freeview HD and Freesat. This is a very easy review to write – if you’re in the UK, and you’re looking to make the most of your HD-ready TV, then Sky+HD is the way to go. The Sky+HD box builds on the success of the Sky + box, with all those great recording features, and adds high definition to the mix. Picture quality is amazing – so sharp and natural, that you’ll want more. Try a flip between National Geographic and GOLD, and you’ll really notice the difference. The set-top box is great (more below), and there’s promise of some new goodies. The box has an Ethernet connector (for the Sky Anytime+ service), as well as two USB sockets (for future use). Another feature worthy of mention is ‘Sky Anytime‘ – This started rolling out in 2007 on Sky+HD boxes. The Anytime service uses space on the hard disk, and captures some top Sky TV programmes and movies overnight. This means that there’s always a selection of programmes ready to watch on-demand. Our views on Sky HD? We’re sold… stunning picture, a powerful box, and the promise of more good stuff to come. Put your HD-ready telly through its paces, and enjoy! Note that the Sky+HD box has the functionality of the Sky+ box. You may want to check out our Sky+ FAQ. HD Installation Sky HD requires a special Sky+HD digibox. You can get one of these direct from Sky Digital – it requires installation by a Sky installer. The Sky satellite dish will need to have a multi-LNB fitted and two cable feeds from the dish to the Sky set-top box. This is so that the Sky+ box can record two channels at the same time. Like standard Sky boxes, the Sky HD box must also be connected to a UK phone line. More details on Sky+HD installation at Sky.com. If you don’t want to pay a subscription, the channels BBC One HD, BBC Two HD and Channel 4 HD are available subscription-free. Do it yourself We’ve been asked if it’s possible to buy your own Sky+HD box, and fit it yourself. Yes – if you wish, you can buy your own Sky+HD box, rather than having to go through Sky. A Sky+HD box requires two separate feeds from the satellite dish, and your dish will need an LNB with multiple outputs – this is to support recording one channel while watching another. Once connected, you’ll need to call Sky Customer Services to get them to “marry” the serial number of your new Sky+HD box to your Sky viewing card, and then to activate the Sky+HD subscription, so you can view the HD channels. Sky won’t activate a box unless they’re happy that it’s legitimate, and you’re not misusing your account by swapping cards between boxes on a regular basis. Need a decent quality HDMI lead? We recommend TV Cables or Maplin Electronics. New-look EPG Sky started rolling out their new-look EPG in March 2009. 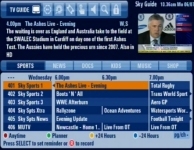 They phased the release of the EPG to boxes with different version numbers and different manufacturers. Some users got the new look EPG version quickly, while others had a longer wait. There appears to be no way to “force” an upgrade to the newer version of EPG – you have to wait until Sky roll it out to your box as an over the air upgrade. Boxes made by Thomson and Pace should have received the upgrade by August 2009. Boxes made by Samsung got the upgrade in November 2009, and Amstrad users got the update in December 2009. Satellite Dish “Do I need to change my satellite dish to get Sky HD?” – No. If you’re able to get Sky at the moment, your existing dish is fine for Sky HD. Note though that Sky+HD needs two feeds from the satellite dish, but standard Sky only needs one. If you only have one feed at the moment, Sky will have to run a second lead from the LNB on the dish to the Sky+HD box. Make sure your Sky+HD box is set to output in HD. Go to Services > Settings > Picture and make sure “HD resolution output” isn’t set to 576. We’d recommend “Automatic”. If you’re still not getting the most from HD, you may want to play with your TV’s picture settings (brightness, contrast, colour, etc), and check that your TV is not in a non-HD mode. As all TVs are different, you’ll need to check the manual for information on how to get the best picture from your TV. No HD TV? If you don’t have an HD-ready TV set yet, you can still get a Sky+HD box and watch in standard definition. You will be able to connect to a non-HD TV set using either a SCART lead or standard TV aerial cable. You can then upgrade to an HD-ready set later if required. More HD channels One of our podcast listeners asked whether we can expect to see Sky Digital phase out non-HD programming over time, to make way for more high-definition programming. Our take is that we’re some way away from that, as there just isn’t the volume of TV programming available in the HD format. Doubtless this will increase, but as with Sky Digital, change is slow, and tends to be driven by user demand. Hi-def UK Gold, anyone? To watch Sky programmes in HD, you need to connect to your TV using an HDMI lead to a suitably equipped HD-ready TV. 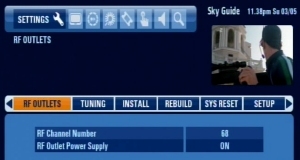 If you have non-HD TV sets elsewhere in the house, you can still connect these to the output of the Sky+HD box – if you’re connecting to a TV in another room, you’ll typically use a co-ax aerial lead. With this solution, you will be able to watch all of the channels from your main Sky+HD box on a second TV – but this will be in Standard Definition (you can’t run HD over aerial cable). You can use a “Magic Eye” TV Link (pictured) with a Sky+HD box to allow you to use a remote control in the second room to remotely change channel. More on Sky Magic Eyes. See our Sky in other rooms section for more on Sky in extra rooms. 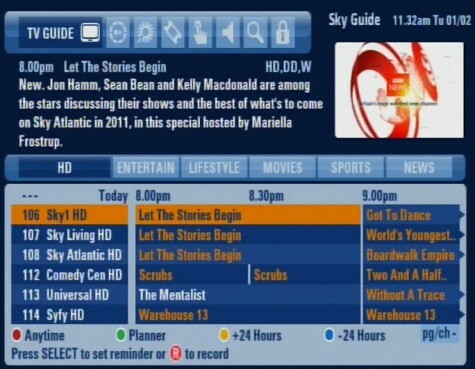 Latest version To check which version of software your Sky HD box is using, press the Services button, choose Settings, then select ‘System Details’. Manual Looking for the Sky+HD user manual? We have found a Sky+HD User Guide for the Thomson and Pace Sky+HD set-top boxes at www1.sky.com/HDGuide, under the “Further information” option. Ethernet port The Sky HD box has an Ethernet (RJ45) port on the back. This is to support connection to the Internet for Sky’s Sky Anytime+ service, which launched in 2010. Video senders Our podcast team had a call from a listener asking whether his existing AV sender used to send TV pictures to a receiver elsewhere in his house, would work with his Sky HD box. Well, the video sender can’t be used to transmit high definition around the home. Firstly, most AV senders use SCART connectors, and High Definition doesn’t work over SCART. Secondly, the bandwidth needed for sending HD wirelessly, isn’t there. Although you can’t send HD using a video sender, as the Sky+HD box has SCART sockets, so you’ll still be able to send standard definition pictures to another TV wirelessly. DVD / CDs We’ve been asked if the Sky HD boxes will play back DVDs or CDs. The answer is a firm “no” – the Sky HD box doesn’t have a slot for a disk to be inserted – you’ll need a separate DVD player connected to your telly to play DVDs and CDs.